The Empress Tap Tremolo is an original design built to include innovative features without sacrificing tone. The audio signal path is analog, but the tremolo effect is controlled digitally via opto technology. You can modulate your sound with three different waveforms. An asymmetrical tremolo was modelled after a '65 Fender Vibrolux (brown face) to give you the fullest tremolo sound possible. A square wave can be utilized if you're after a harder sound. And if you're looking for a more normal tremolo, you can use the triangle wave setting. Gain - The Empress Trem has a gain stage on the output. It's able to deliver up to 12dB of gain without adding any distortion to the signal. Perfect Size - The enclosure measures approximately 4.5" by 3.5" by 1.5", which is delightfully small when considering all the features packed into this unit. Presets - Save all your settings in up to 8 presets and recall with the touch of a button. Pristine Sound - The Empress Tap Tremolo2 Pedal has to be heard to be believed. It's whisper quiet and free from the "LFO throb" usually associated with tremolos. We dare anyone to find a better sounding tremolo. 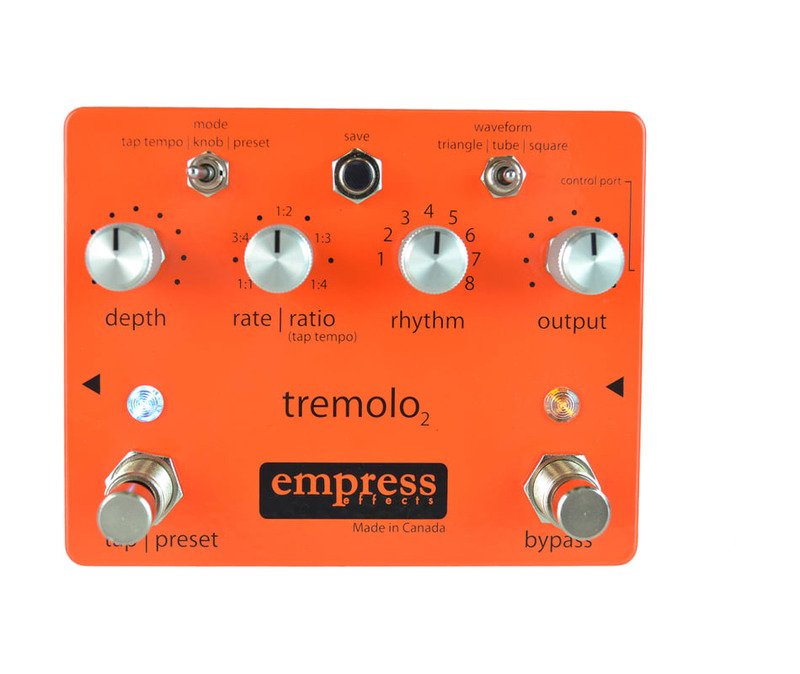 Tap Tempo - The Empress Tap Tremolo2 Pedal averages your last four taps so it plays in sync with your music. You can also choose different tap to tremolo rate ratios. 1:1, 3:4, 1:2, 1:3 and 1:4 are available. True Bypass - The Empress Trem employs true bypass, so you can be sure that it's not affecting the signal when disengaged. Buffered bypass is also available if that's your thing. Waveform Selection - You can modulate your sound with three different waveforms. An asymmetrical tremolo, A square wave, And if you're looking for a more normal tremolo, you can use the triangle wave setting. Rhythms - Another exclusive feature. The Empress Trem will definitely do your run-of-the-mill tremolo sound to a tee. But you can also set it to play different rhythms. Check out the soundclips for examples.